Let me start by saying I’ve been playing all iterations of Games Workshop games since the 90’s. And as you can guess from the title, this isn’t a bitter post of a disgruntled veteran. I saw Warhammer Fantasy grow and become bloated and epic and amazing all at the same time, and witness its ultimate transformation into what it is today: Age of Sigmar. I won’t get into that whole debate because it’s been beaten to death, but my short answer is: it was a good thing. Similarly, I saw 40k change over these years (for the better, believe me) with more rules, units, and powerful Lords of War. These weren’t the same games I first started playing when I was a boy! So when Kill Team was released, I was thrilled! A small scale unit-on-unit fight with simpler-than-Mordheim styled rules for individual actions. My play time these past 10 years has been limited to say the least, with my personal life and becoming a proper adult (and husband, and father!) all taking precedence (as mighty as the God emperor is, he won’t pay my bills!). I saw Kill Team games as a perfect opportunity to dip my toes back into actual play without committing hours to the endeavor. 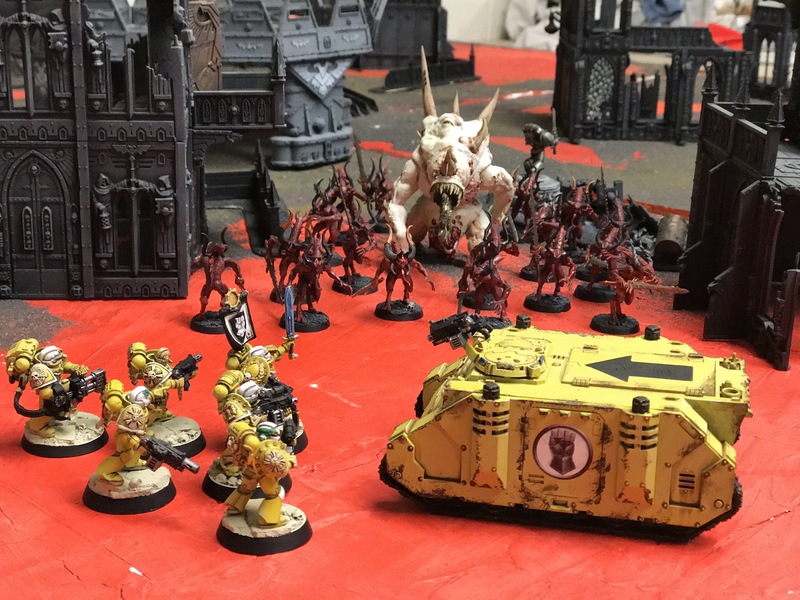 I bought the box game, built some marines (to add to my growing Imperial Fist army, of course), and learned the few unique rules to this game set – simple enough! 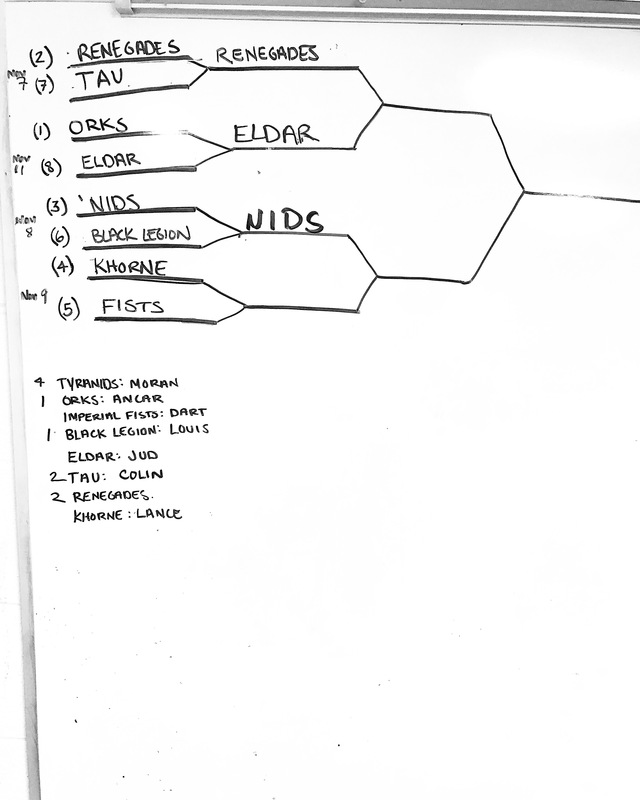 I then brought the idea to my gaming group at work (remember, I’m a high school teacher with both students and faculty colleagues that play), and they took to the idea, eager to create their own lists. Six Sternguard from the Imperial Fist 1st Company stand in defiance of a daemonic incursion. After I handily beat the Khorne Daemonkin, I was matched up with the Tyranids. It was a tough fight, but I won by forcing the retreat of much of his army. My paltry six Sternguard were massively outnumbered. After the game, it dawned on me that I forgot to check the Tyranids list, and he “forgot” to add the points of many of his weapon upgrades, which had me up against a 300+ point force! 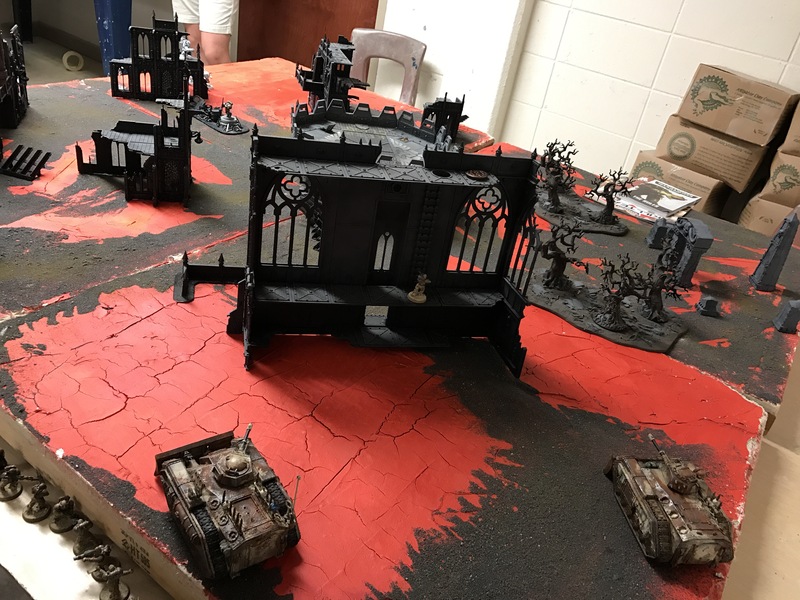 I gave the Tyranid player (a colleague) the benefit of the doubt, but I’m glad I won the game so I wouldn’t have had to raise accusations and look like a sore loser in front of the students. I have no problem losing for the sake of the kid’s enjoyment, but I want it to be a proper loss! Lessons learned all around. Disciplined hellfire and kraken rounds won the day, here! Coupled with various Feel No Pain and other flavorful special rules from IA:13, I had a very tough fight in front of me (remember, I only have SIX models and a Rhino!). 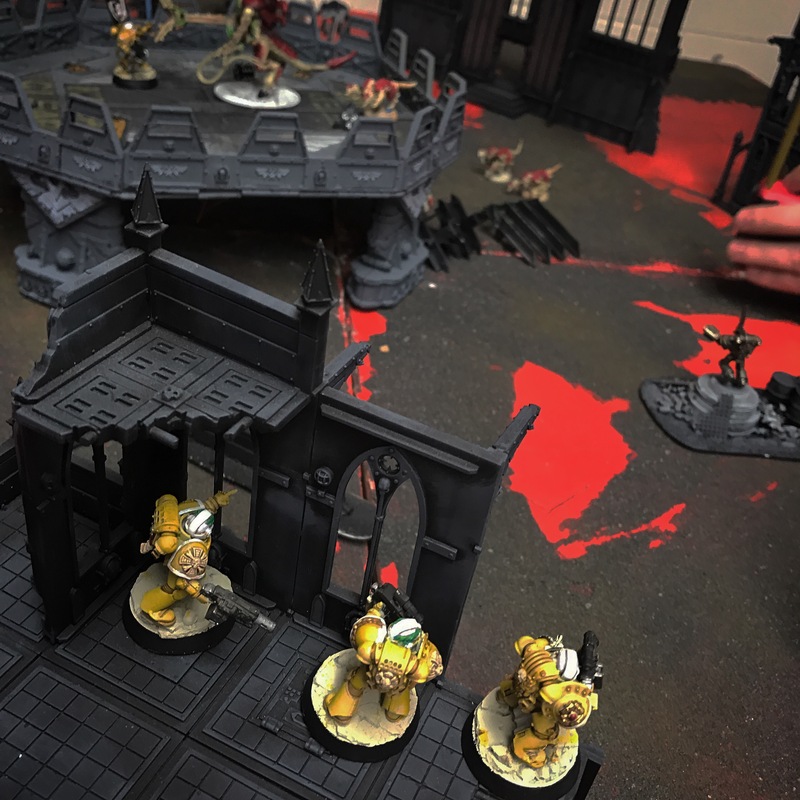 I had to try and kill 10 Guardsmen to get a route check – but that’s a minimum of two turns of enemy shooting at me, which wasn’t a pretty vision. To make a long story short, I got very lucky, blowing up a Chimera (and vaporizing a handful of the passengers in the process!) with a well placed combi-meta shot. My Sternguard picked off a few more guardsmen before suffering a casualty myself – but in the end my plan to force a rout worked. I won the field! I controlled 2/3 of objectives, got First Blood and Slay the Warlord, and ran the enemy off. The Emperor will be pleased that his loyal sons have defended this ruin in his name. A shot of the two Chimeras prior to actual deployment. It looks a lot scarier with twenty guardsmen out there! Overall, I am very pleased with Kill Team and the style of play that it offers. It’s fast paced, exciting, very cinematic (forging the narrative! ), and most importantly: fun! We played our games in 45 minute lunch breaks, with some of the more complex games taking two lunch periods – these aren’t long, drawn out affairs that are bogged down with minutiae. Granted, I had to recheck some rules myself, as we demonstrated the game to spectators, so the games could have gone a little faster all things considered. I can’t wait to incorporate these games into our overarching campaign! Tell me what y’all think of Kill Team! Like it, hate it? Do you use any house rules you think we should know about? Let me hear it in the comments!